■ What is Smart Check? .This function enables you to check the status of the washing machine using a smart phone. .It is recommended that Android OS 4.0 (ICS) or later are used. and install it. You can easily find it by searching for "Samsung Smart Washer". 1. Alternatively, the Smart Check function can be run if no button is pressed after the washing machine is turned on. to run the Smart Check function. 4. Run the Samsung Smart Washer app on your smart phone and tap the Samrt Check button. ※'Smart Check' may be changed to 'Smart Care' according to the language selection. 5. Focus your smart phone's camera on the Smart Check code displayed on the washing machine's display panel. the smart phone may not be able to easily recorgnize the Smart Check code. the smart phone are parallel or nearly parallel. the status of your washing machine, the error and the countermeasures are displayed on your smart phone. 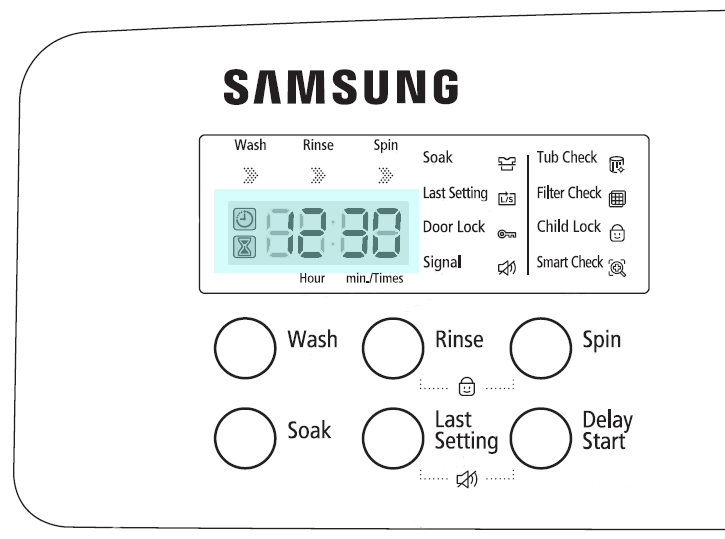 displayed on your washing machine's display panel into the Samsung Smart Washer app manually.